School boards have one job: equitably provide the best possible learning experience for all students with the resources available. That is why, as a candidate for Fairfax County School Board from the Providence district, I propose greening our schools, bus fleet, and curriculum as part of a Green New Deal for FCPS. No other investment in our students has so many potential benefits. I don’t have to tell you that we simply can’t wait for Donald Trump to address the climate crisis when his fossil fuel-addicted industry cronies running the Environmental Protection Agency and the Departments of Energy and Interior are hellbent on making the situation worse. Instead, every level of government must do its part in addressing this humanity threatening emergency: reducing risks while seizing opportunities. This Green New Deal for FCPS won’t be implemented overnight, but we owe it to our children to build on the successes of our current school board by going even further, thinking even bigger, and moving even faster. What follows is a list of principled ideas that I encourage all candidates for Fairfax County School Board to consider and help implement if we are elected. Solar Power: This month, at School Board member Pat Hyne’s urging, FCPS staff agreed to add three schools to Fairfax County’s request for proposal (RFP) for a solar power purchase agreement (PPA). While this progress should be applauded, it simply isn’t enough for a school district with nearly 200 schools. While additional schools could be added to the program down the road, a thorough plan must be developed and implemented to bring solar power to every school in the district. Charging Stations: In 2017, important legislation by Del. David Bulova was signed into law by Gov. Terry McAuliffe allowing school boards to install electric vehicle charging stations on school property. To date, only one FCPS school has taken the plunge. We need to make sure FCPS is taking advantage of state and federal money that might be available to install additional charging stations. And, like our approach to solar power, a thorough plan must be developed and implemented to bring charging stations to every school in the district. Electric Buses: Traditional school buses aren’t just bad for the environment, they’re also bad for student health. Diesel fuel is a proven cause of respiratory diseases and can make existing problems like asthma even worse. Fact: healthier students are higher performing students. Reducing student exposure to diesel fumes boosts educational outcomes. Of the 1,630 buses in the FCPS fleet, only one is a plug-in hybrid-electric. Each year, the district purchases 10.3 million gallons of diesel and unleaded gas to fuel the rest. Around the globe, electric buses are one of the fastest growing portions of the electric vehicle market. FCPS should transition to an electric bus fleet. Doing so would be the equivalent of taking 34,000 cars off of the road and eliminating nearly 200,000 tons of climate-altering pollution every year. This change would also control costs as electric bus maintenance is far less expensive and electrons are cheaper per mile than burning polluting fuels. We must also make sure dollars that could be spent to facilitate this transition are not being left on the table. Food and Nutrition: FCPS has made strides when it comes to its food and nutrition services program. As the Get2Green program notes, the district works to “maximize the availability of fresh and local foods” and is “in the process of partnering with farmers and FCPS schools to promote local food procurement.” These developments should be encouraged. Students should be taught about the impact of their food choices on the environment and climate, while also being incentivized to make healthy choices. By adopting a Green New Deal, with measures like those articulated above, FCPS can fulfill its mandate for pursuing the highest-quality equitable educational services within available resources. Smart building will drive down energy and maintenance costs. Electric vehicles will lower transportation costs. The healthier school environment will foster higher-performing healthier students. While making such changes would likely be seen as a tremendous achievement, they should serve as a starting point rather than a destination. Solar panel value doesn’t stop with produced electricity. It offers educational opportunities for all grade levels. Kindergartners could use them to learn about the difference between night and day, summer and winter, and differentiate cloudy from sunny days. High school students could analyze life-cycle environmental impacts of solar on their rooftop compared to using grid-provided commercial scale renewables, coal and/or nuclear power. Electric buses, better HVAC systems, and the food and nutrition services program could be used in Career and Technical Education courses to provide students with hands-on experience in food procurement and training with advanced automotive and HVAC systems. 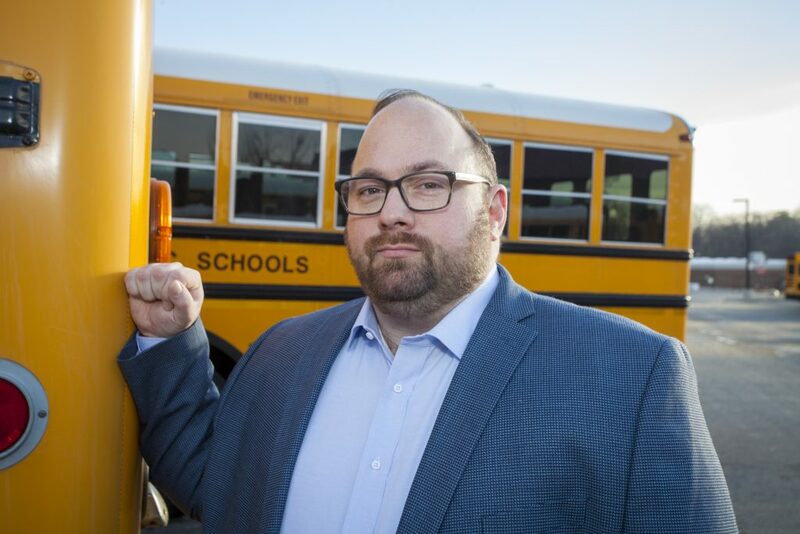 Daylighting, an electric bus fleet, better HVAC systems, and access to better food options will have positive impacts on the physical and mental health of students, which could result in fewer absences, increased educational achievement, and better performing educators. Again, the benefits of a Green New Deal for FCPS go far beyond the environment and the potential impact on students in the classroom. These concrete steps to green our schools, bus fleet, and curriculum would also positively impact Fairfax County by saving taxpayers money, growing the economy, creating jobs, reducing pollution, and improving public health to name only a few likely additional advantages. It would be foolish for me to presume I have all of the answers. I don’t. We are all in this together, and I want to hear your suggestions. What are other ways we can green FCPS schools and curriculum to confront the climate crisis head-on? Are we bold enough to do the right thing? I believe we are, and we can start today. Previous articleVideo: VA House Republicans Kill Minimum Wage Increase. Because That’s What They Do. Next article45 Minutes, One-on-One via Skype with My Conservative Congressman Talking “the Wall,” the Shutdown, Trump, etc.